With the Super Bowl just around the corner, brands are already limbering up for the Big Game by releasing teaser spots - essentially ads for their actual Super Bowl spots. We’ve already seen a number of spots, many of which star big celebrities, including Steve Carell (Pepsi), Michael Bublé (Bubly), The Backstreet Boys (Doritos) and Kristin Chenoweth (Avocados for Mexico). But just how effective are these shorter format spots at driving awareness for the main spot? Well, we analysed one teaser ad from M&Ms starring Christina Applegate using our #emotionAI technology to find out how well it is resonating. Did the ad grab the audience’s attention, making them demand to know what is going on when the full ad comes out? 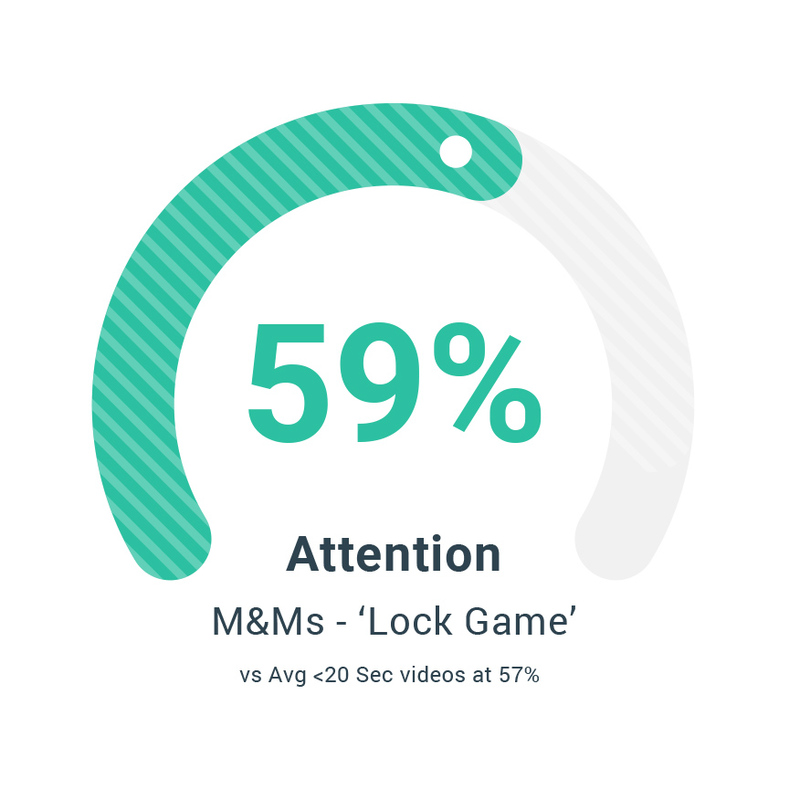 Well, probably not quite as much as M&Ms would have hoped.Just over half (58%) of the audience we tested paid any attention to the 15-second ad. That’s slightly below the average for shorter format ads within the food and beverage ad (59%). The ad also attracted an average attention span of 59%, which means on average the people who saw the ad managed to pay attention without interruption for just over half of the video. The average for food and beverage ads under 20 seconds is 57%. Looking at the emotions the spot elicited from its audience, viewers were initially confused at the start of the ad as they tried to understand what was going on.Arguably, this kept viewers involved in the story and eager to learn more. Once viewers caught-on, the emotional responses were overwhelmingly positive. The ‘happy’ emotion starts on a positive trajectory, moving into the :02 mark and continues through the end of the content, including the ever-important ‘leave respondents happy at the branding’ moment at the end. Overwhelmingly, respondents appreciate the sentiment and humor of the ad, with many viewers calling the ad “funny”, “ hilarious”, “humorous” and “inviting”. Just who is in the car? For some, it was a question that intrigued them, pushing them to find out more. However, some were confused and even concerned. Some cited concern that a baby or child may have been left alone. 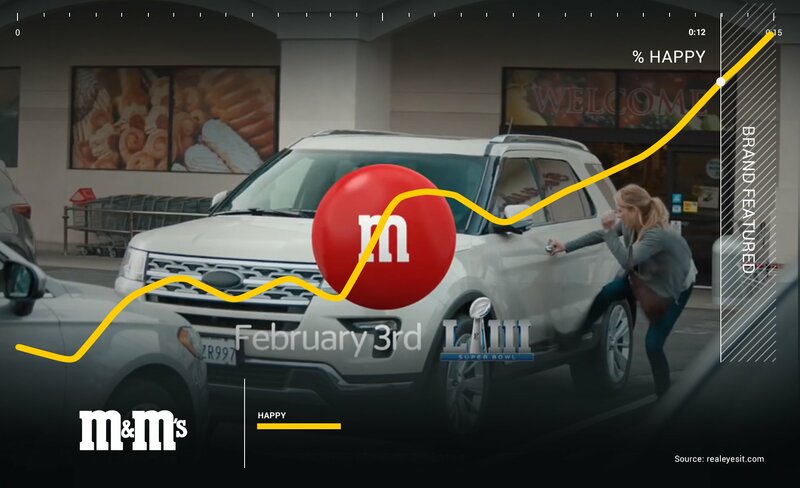 Another area of potential optimization is the stated lack of connection to the M&M’s brand. Some respondents indicate confusion over the connection to the brand, and some think the ad is for a vehicle. Stay tuned for more Super Bowl insights over the coming days, including our 2019 Super Bowl Chart, which will use our emotion, attention and sentiment measurement scores to rank all of the ads during the Big Game.